Offering you a complete choice of products which include railing ss ball, railing ss oval ball, railing sit ball set and railing ss hollow ball. With the support of our experts and sophisticated in-house facilities, we have been able to offer an array of Railing SS Ball. Our ball is used as the top fitting on balusters or railings to enhance sophisticated look. 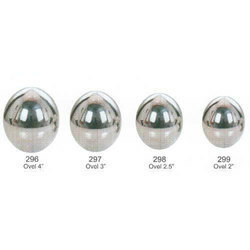 This ball is manufactured using stainless steel which is polished with latest techniques that ensures the optimum shine and rust resistivity. Customers can avail this ball from us at market leading prices. We are engaged in offering a comprehensive range of Railing SS Oval Ball, which is available in different capacities and weights. It is well known for its long service life, rigid construction and efficient functioning. Our Oval Balls are tested well on several parameters to make sure that their remains zero flaws in the offered Oval Ball. Apart from this, these oval balls are available at affordable prices to the clients. With a precise understanding of the relevant industry, we introduce ourselves as the leading manufacturer and supplier of Railing Sit Ball Set. 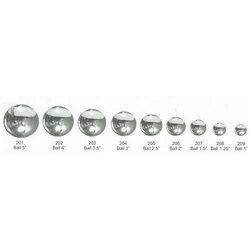 The ball set is offered in different sizes which give the flexibility of choosing the appropriate size. Our set is provided to add to the beauty of the railings through the excellent shine. We are offering the ball set at most nominal prices in a market. 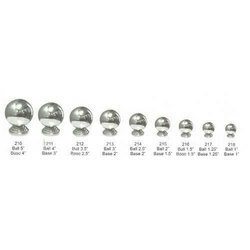 For the diverse requirements of our valued clients, we bring forth a broad array of Railing SS Hollow Ball. The offered ball set is designed in line with the industry standard using the finest quality stainless steel and ultra-modern technology. 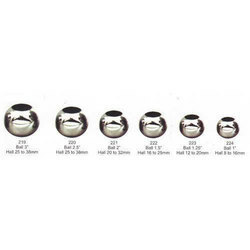 Our provided ball set is tested on various parameters of quality by our quality examiners. Moreover, this ball set is well appreciated in the market for its attractive design and modern look.